We see that the above visualization still doesn’t give us the desired result. 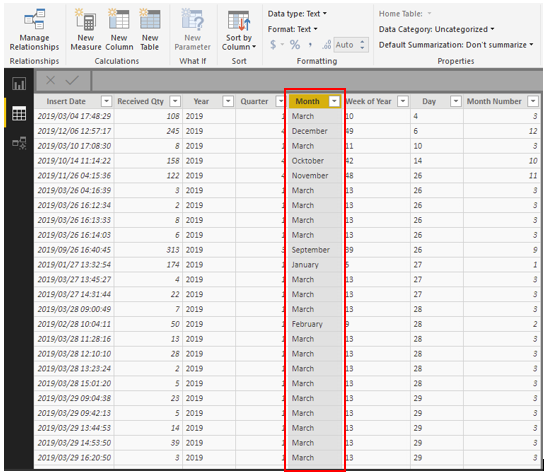 What Power BI is doing here is that it is sorting the month’s column in alphabetical order as the month’s column is stored as a text field. Thus Power BI is behaving in the correct manner. We have to find a more suitable solution for this. Let’s have a closer look at our dataset. We see here that we have a column with the month name, which is a text field. We also have a column called ‘Month Number’. The ‘Month Number’ column has a data type of a whole number. 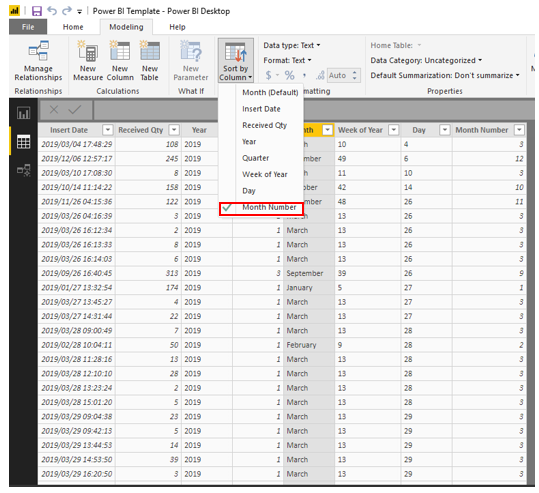 So from this, we can see that the month name can be ordered in sequential order if we select the ‘Month’ column and order it by the ‘Month Number’ column. To do this first select the ‘Month’ column. Now we must head over to the Modeling tab and select the Sort by Colum as ‘Month Number’. Now let’s go back to our visualization to see the result. Perfect, we can see that the months are now sequentially ordered. We can see that Power BI have a lot of interesting ways to overcome some of the simpler functionality problems that we may run into.